The vision of a telegraphic network within Tasmania, which also extended across Bass Strait to Victoria, had been discussed as early as 1853 - at the same time as planning for the first Victorian telegraph line was underway. That was also the year in which the Colony changed its name from Van Dieman's Land to Tasmania. From the beginning, information on the development of telegraph lines in Tasmania has, however, been difficult to obtain (see page 4 of the 1858 NSW Electric Telegraphs Report to the Legislative Assembly). Hence opening dates of telegraph offices are generally not known. There is also confusion of dates between opening of the telegraph office as opposed to the opening of the Post Office and/or the Railway station which were frequently housed together. the Tasmanian Main Line Railway Telegraph Offices. "TO CONTRACTORS: Tenders will be received at the office of public works, Hobart Town, until Monday the 15th September next, on the part of the Government, for the section of a line of Electric Telegraph from the Low Head at George Town, on the northern side of the island, to the signal station at Mount Lewis, on the southern side at the head of Storm Bay. From Hobart Town to Mount Lewis (about 20 miles). Separate tenders for each division. It is with much pleasure that we are enabled to announce to our readers that a tender for the construction of the first Electric Telegraph in Tasmania has been accepted by the Government. The line is from George Town to Mount Lewis; and it is anticipated that it will be complete and in full operation within six months from this date. Mr Butcher of Melbourne (who has had several contracts of similar nature in Victoria) is the party who has undertaken the performance of the work. We understand that the amount to be given for the due fulfilment of the contract is rather above £10,000. Construction began with the Launceston to Hobart line. The line was planned to follow the easiest terrain even though that was not necessarily the most direct. Tasmania is so mountainous that it was important to select routes along valleys whenever possible. It also was to follow the established road between the two towns. south-west to about Oatlands on the shores of Lake Dulverton which had a barracks, a gaol, a courthouse, numerous inns (six licensed hotels by the 1850s), churches, schools and dwellings. It was the centre of a prosperous rural area, noted for sheep, cattle and grain. It was also a convenient point midway between Launceston and Hobart Town. Just past Oatlands, it was possible construct the new line in one of two directions - to Brighton or to Richmond. The Brighton route was the easier and it could go near Green Ponds (later Kempton) which was a popular first night stop for the trip from Hobart to Launceston (about 24 miles from Hobart). 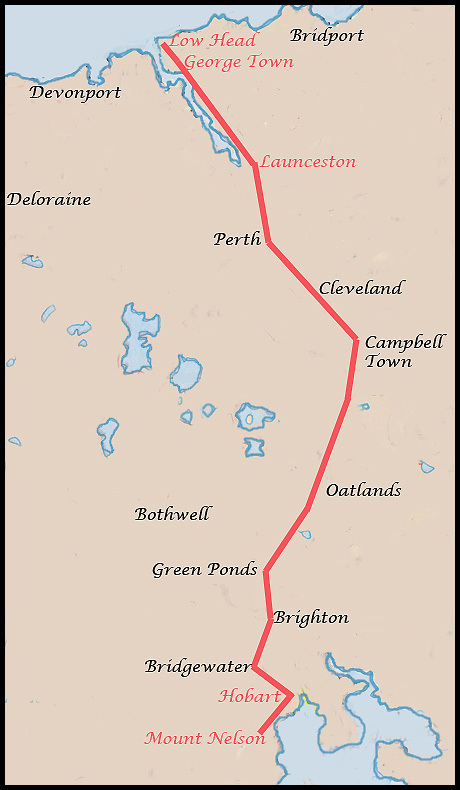 The line was constructed directly from Oatlands to Brighton with the connection to Green Ponds made in January 1870. After Brighton, the line crossed the Derwent River at Bridgewater en route to Hobart Town. No telegraph stations were opened at the intermediate places at this time. The priority was to link the important northern and southern centres. The only observation out of the ordinary - and it is perhaps apocryphal - is that construction started simultaneously from both Hobart and Launceston and both teams started erecting poles on the right side of the road. The teams finally met south of Campbell Town near Wanstead (probably the special Wanstead Park made from rammed earth). At that point, one team had to cross the road to make the final join in the line (but we do not know which team). "Electric Telegraph. This work, which is to all but annihilate time and space, in communicating between Launceston and Hobart Town, draws very near completion. The line of posts and wires is complete to the town boundary, and from thence to the Post Office its course has been pegged out on the footpaths. It is to come along the east side of Wellington Street to the corner of Patterson Street, opposite the Court House, along the north side of that street, to thepublic buildings beside the Post Office. The Director of Public Works visited Launceston and inspected the public offices this week, for the purpose of deciding upon the most convenient of them, for so important a purpose as that of the electric telegraph office, and his choice has fallen on some of the rooms in the building immediately adjoining the Post Office. We believe they are those now occupied by the Registrar of Births, Deaths and Marriages, certainly, without exception, the most suitable locality at present in Launceston for such a purpose, but we trust ere long to see a building erected, not rented, in which nearly all the public departments in town, can be accommodated with suitable offices for the transaction of public business in". The Launceston Chronicle reported on 13 June 1857 that "the (Electric Telegraph) wire has been brought into contact with the battery in the Telegraph Office (at Launceston) and Messrs. Butcher are busy putting Morse's Recording Telegraph in trim for commencing operations on, if not before, the 1st July next ... We observe that tenders are called at Hobart Town for sinking the last post holes on the line up to the old Gaol which, it appears, to be converted from an old dungeon into its very antithesis an Electric Telegraph Office - an agent for enlightening the world". It appears as if the line was completed by 8 July 1857. A Mr. E. S. Chapman ("Augur" of the "Australasian") claims to have sent the first telegram on that day from Launceston to Mr. Davies at the Mercury at Hobart Town which was at that time a newspaper published on three days each week. The Mercury published the telegram as an "extra". The "contemporaries" of the Mercury do not appear to have greeted the communication with positive comment. "We have, at various times, explained the principle of the electric telegraph and the progress in its erection in the colony. The line between Hobart Town and Launceston was opened yesterday and several messages passed both ways with answers". "We are proud to record the fact that the first telegraphic message from Hobart Town to Launceston was despatched by ourselves and the answer received and promulgated on Wednesday afternoon by our extraordinary from this office. For this accommodation, we are indebted to the kind courtesy of our friend, Mr. W. H. Butcher, who on this, as on all other occasions, evinced the urbanity which has gained him the estimation of the public. While we mention this with gratification, we have to note something else with disgust and reprehension. The miserable abortions in this city, miscalled newspapers, have filched from us without acknowledgement the whole of our extraordinary verbatim et literatum. We are at all times quite willing to impart a little vitality to their wretched prints with extracts from this journal but as our intelligence is gained by great personal exertions and by means not available to the pilferers, we at least expect an acknowledgement of the transfer. We had determined not to notice any of the publications, and were content to let them die out like a farthing rashlight and leave not a snuff behind but when such bold and pitiful larcenies as these are so unblushingly committed, we cannot refrain from exposing the robbery". On 24 July, the Mercury also carried the following: "A discontinuation in the line was discovered in the marine cable at Bridgewater which had previously escaped observation in consequence of being covered in gutta percha. It was by the aid of the magnet that the damage was traced". "It is raining very hard. "The Queen (one of the sailing vessels) is expected and due to-day but is not yet in sight". "We are able to announce that on and after Monday next the electric telegraph will be open for the use by the public". The first extension to the basic line (as contracted) was built through dense terrain from Launceston to George Town in March 1858. On 13 March, Mr. Butcher reported that "the George Town station was open and working beautifully". The line was extended to Low Head in October. The inclusion of George Town in the first plan for construction was motivated by the thought, at that time, for the submarine cable to be constructed from the north-east of the island at Low Head to Wilson's Promontory in Victoria. In the south, the line was extended over easier terrain from Hobart to Mount Nelson and connected on 9 July 1858 " after some delay arising from objections from Lieutenant Corbett, formerly officer in charge, who could not spare a room for this instrument in his quarters and an out-structure was used much to the deterioration of the apparatus from damp." The Daily News hears the Government has abandoned its intention of carrying the electric telegraph from Hobart Town to Mount Lewis, and Mount Nelson has been fixed upon as the southern terminus of the line. in existence have been thrown into disorder ... We hate the meddling spirit that cannot let well alone". An interesting reflective comment was contained in The Mercury in February 1858. A major use of the telegraph line in the early years was to record and monitor ship arrivals and departures. Communications were exchanged through the telegraph lines amongst Hobart Town, Launceston and Low Head at 9:00 am and 3:00 pm each day. The information sent from Low Head was first relayed from Mount George using the manual semaphore system. Arrivals: "Euphemia" and "Flying Squirrel" from Melbourne. Sailed: "Helen S. Page", Port Albert; "Louisiana", Melbourne; "Prince of Denmark" Geelong. Once the basic line had been constructed, there was a pause in general construction activity for lines within Tasmania until about 1872. Telegraph Offices were opened along the first line and short branches were constructed. The distances must however be considered relative to the terrain which existed in the 1860s. For example, a cricket match played in December 1862 at Bothwell against a Green Ponds team saw victory to the home team. The report in the Mercury explained the defeat in the following way: "The Green Ponds men were evidently playing under a disadvantage, on strange ground after a fatiguing journey of l8 miles". Hobart Town (Chief Office), Campbell Town, Green Ponds, Launceston, Ross, Brighton, Low Head, Oatlands, New Norfolk, Nine Mile Springs, Melton Mowbray, Mount Nelson, Longford and Bothwell. Port Arthur is also listed as a Semaphore station. The focus instead switched to the development of the cable link to Victoria - and overcoming the difficulties which beset those ambitions. In 1891, a quadruplex system for transmission was introduced on the Hobart-Launceston. Messages for George Town, four miles from Low Head: A Messenger leaves Low Head daily at 2 pm for George Town, returning from the Police Office at 3:45 pm. For messages so left, no extra change will be made. Urgent messages to or from George Town can be sent at any time on payment of 3s extra. A blue flag (No. 3 on page 86) is exhibited at the chief office, Hobart Town when it is known that the English mail has arrived at Adelaide; a blue and white chequered flag (No. 14) when it reaches Melbourne; and a red flag (No. 6) immediately it is telegraphed as approaching low Head. The arrival at Sydney of the mail via San Francisco is signalled by a red and white chequered flag (No. 32). At Launceston, the arrival of the English mail at Adelaide is signalled by a white pennant with a red ball; and when the steamer with the mail is sighted at Low Head the same flag and a red flag below is hoisted.